PSNews - Permanent Deputy PM Truong Hoa Binh, January 30, paid pre-Tet visits to the Investigation Police Department on Drug-related Crimes and Criminal Police Department under the Ministry of Public Security (MPS). According to reports delivered by Major General Pham Van Cac, Director of the Investigation Police Department on Drug-related Crimes at a meeting with the deputy prime minister, the police force on drug-related crimes investigated 24,552 drug cases, arrested 37,842 involved people, seized 1,584 kg of heroin, 136.98 kg of cocaine, and a large amount of other types of drugs as well as 133 guns and 2,044 bullets, 81 billion VND in cash and various exhibits. For its achievements, the department was presented with a Certificate of Merit by the Government while 8 officers of the department were presented with Orders “Feat of Arms” of various kinds and 7 others were awarded Certificates of Merits by the Government. On behalf of the Government, the Permanent Deputy PM praised the efforts and achievements of the whole force as well as highly appreciated the efforts, victories and sacrifices of all officers at the Investigation Police on Drug-related Crimes. Permanent Deputy PM also paid tribute 23 police martyrs who had sacrificed themselves in the fight against drug-related crimes for peace and happiness of the people. 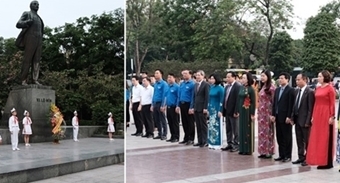 On the same day, Deputy PM Truong Hoa Binh also visited the Criminal Police Department. At the meeting, Major General Tran Ngoc Ha, Director of the Department, briefed the Deputy PM on outcomes of the task performance the department in 2018. Particularly, the rate of successfully investigated criminal cases reached 82.32% while the number of the total criminal cases reduced by 0.61% compared with 2017. The Department was honored 7 times with the Letter of Complements by the MPS’s leaders while 241 officers and soldiers were presented with Certificates of Merit of all kinds. The Deputy PM emphasized that many police officers and soldiers sacrificed their lives while preventing and fighting crimes and ensuring social order and safety. Mr. Binh also asked the department to grasp the situation, drastically attack crimes in key areas, especially mafia-typed crimes, newly-emerged, non-traditional, hi-tech crimes, black credit and human trafficking. Permanent Deputy PM Binh urged the department to mobilize forces to effectively implement plans to attack crimes and ensure security and order on the occasion of the upcoming Lunar New Year and spring festivals.